It seems only a few weeks since I returned from the 2015 Annual Meeting for the Society for Experimental Biology (SEB) in Prague. 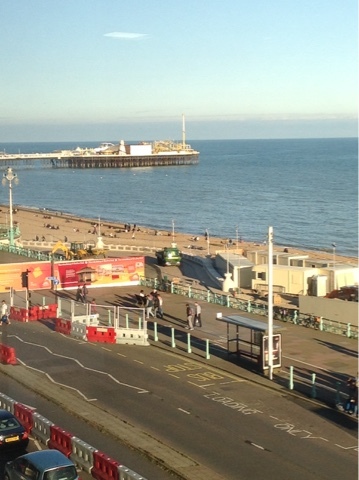 But no, a whole year has gone by and here I am in Brighton for the 2016 meeting - as an official science writer for the society! It will be my job to scout around for exciting new research to turn into articles for the members' magazine. I've already trawled through all the abstracts ( over 600 of them! ) and it's clear that it's going to be a jam packed week. Fortunately I am staying in the ( rather grand ! ) Hilton Hotel, just minutes from the action at Brighton Conference Centre. But today has been one of relative calm before the main conference kicks off tomorrow. 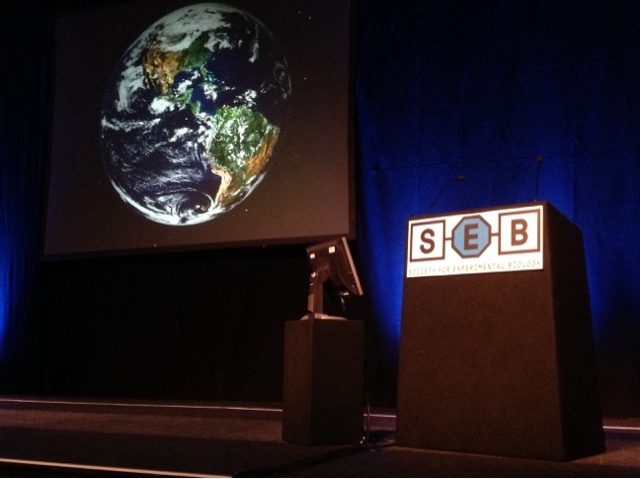 Like last year, it has been a chance it bring the younger SEB members together to share ideas on how to maximise the impact of their work and their personal profile. The question this time was why and how should scientists engage with the media to publicise their work? As Sarah Blackford (head of Education and Public Engagement at SEB ) put it: "If you don't communicate it, it doesn't exist! All that hard work in the lab could be wasted if you don't tell anyone about it." But public engagement requires a very different style of writing to the weighty academic paper; it has to be succinct, engaging and above all stand out against the now constant deluge of new information. Sarah made the point that scientists are used to waiting to the end of a paper before they mention the wider significance of their work, whereas for a press release, the impact needs to come first. Think about it as though you have just won a competition: start by saying "I've won a prize!" then tell us how you did it, not the other way around! Jenny Gimpel ( a science PR worker) then gave us her insights into the media industry, particularly the increasing role of social media. Now that so many of us have a smartphone, it comes as no surprise that more and more people are getting their news updates from Facebook and Twitter, rather than TV and Radio. This gives scientists unprecedented opportunities to reach new audiences, spark new discussions and counter bad science with the truth. But this comes with the risk of messages becoming distorted or misunderstood. "Be aware that people can change their behaviour based on what you write - especially if it is related to health" Jenny cautioned. "In the past I have even received medical reports from people, asking me for advice!" Often, such exaggeration and hyperbole is blamed on journalists that care more about creating a story than telling the truth. But Alun Anderson, former editor of New Scientist, argued that these suspicions can make it very tricky for journalists to engage with scientists to find the heart of the matter. "It's been said that a journalist is a person whose job is to explain to others what s/he does not personally understand" he said "And scientists don't like talking to people who don't understand!" Yet a responsible journalist can transform the dry details of experimental research into news items that reach wide audiences, and scientists should make use of their skills. Rather than racing to the headline, journalists actually often spend a lot of time building up trust with researchers, exploring their passions and learning the basic details of their work before committing to paper. It's time scientists started to meet them halfway, and stopped seeing all journalists as pest. After all, "our job is to EMPOWER the public so they know what is happening in the world" concluded Alun. Public engagement was also a theme in the evening's Science with Impact session, this year entitled "Biodiversity: Here , There and Everywhere". This started with a gloomy picture : across the world , species of every taxa are disappearing at an alarming rate. Besides the 'classic' problems of urbanisation, increasing population, climate change and pollution, we are witnessing new, emerging trends such as micro plastics in the oceans and contamination from discarded pharmaceuticals. However our speakers offered hope that not all is lost yet. Botanist Sandra Knapp (Natural History Museum) enthralled us with her tales from her career of over 30 years of hunting out new plant species in remote, tropical locations. But she made the point that all biodiversity - even in urban areas - is essential and valuable, not just rare exotics. "Discovery comes in all forms and flavours" she said. "If you discover something that's new to you, but not to science, then it's still new!" Yet even urban areas can play their part in reversing biodiversity loss, as Maureen Berg ( University of Brighton) explained. With thoughtful urban planning and 'green infrastructure', cities can be transformed into a mosaic of micro habitats. This goes beyond parks and gardens but includes the potential in allotments, disused railway lines, canals, even rooftops. "Green rooftops have a massive potential to help cities meet their biodiversity targets" she stated, using the example of the Moos Water Filtration system, one of the earliest green roof prototypes (1914). Apparently,this now boasts 13 species of orchids, including locally rare specimens. Yet this urban 'greening' brigs us countless benefits as well - improved air quality, flood protection, mental and physical well being, even higher house values. But these benefits have to be communicated to the public, as we all need to play our part to safeguard species futures, argued Steven Cooke (Carleton University, Canada). Although we can be tempted to think that we can " engineer our way out of the situation", ultimately "just doing the science is not enough - people are the most important part of the solution" Steven stated. Whilst one person alone can't halt global warming, each of us collectively has an impact though how we vote, what we buy and how we interact with our environment. If we are to protect the remaining species on this planet, we need to stop seeing scientists and the public as separate entities - we are all in this together. In this respect, scientists could learn from NGOs: many people know about dolphin friendly tuna, for instance, thanks to Greenpeace, but micro plastics within everyday products is still mostly unheard of. It's clear that as scientists, we will need to take a broader, social view to appreciate the issues that are important to the public and help them to understand how helping biodiversity ultimately helps them in return. As Sandra put it "it's not so much a question of changing their behaviour, but changing their lives so that people want to change their behaviour".